But now Hockey’s Back, and we’re supposed to get excited that you got to hold all our season ticket money giving us a whopping 1% interest. Excuse me if I don’t get overly excited about 15 fewer home games, players who will have to rush to get back in shape, and some slop hockey that will lead toward a bewildering playoffs. 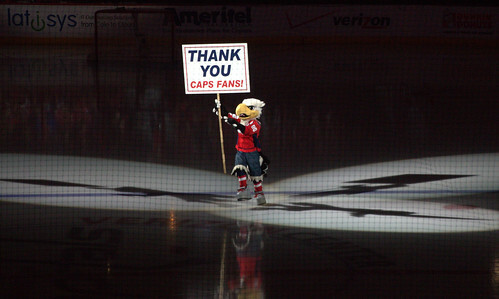 I won’t be rocking the red anytime soon, as it seemed that the owners and playoffs both deserve some time in the penalty box for slashing the fans’ hearts, tripping up local businesses, and icing the Verizon Center’s pulse in the heart of the city. Don’t think you’re getting a free pass. I tweeted a link this morning to a much more heartfelt apology from the St. Louis Blues to fans. I would much rather have seen something like that. So here it is, hockey. Finally. I was sure we were going to miss another full season (twice in a decade? Outrageous!) but lo and behold, here we are. 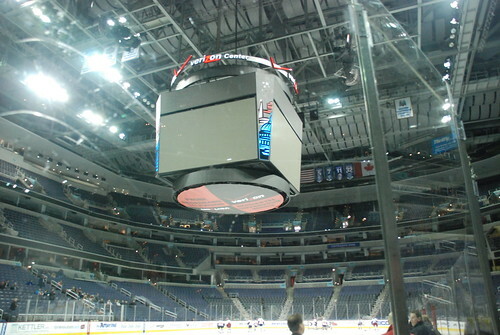 Soon enough, the Verizon Center will be filling up with eager Caps fans sporting the red, cheering on new coach Adam Oates and a tweaked Caps team for the short campaign ahead. You won’t find me in the crowd, however. When it became more and more clear over the course of last summer that a lockout was guaranteed, I was pretty ticked off. Yet again, it seemed that the owners – headed by Napoleon-esque Gary Bettman – were grasping for yet more money and the sport be damned until they got what they wanted. A lot of shenanigans went on just before the lockout. After the doors were slammed shut, the PR circus began. It’s pointless to rehash the lowlights, because it honestly would only make me angry all over again. Sure, I followed the news on what was going on. But it wasn’t worth writing about, because all we fans could do was blow and rant. I commend the various hockey reporters out there who tried to make the most of the smattering of hyperbole and half-truths tossed out by the union and the owners. It just wasn’t something I wanted to join in on. And then it got worse: I found out that Caps owner Ted Leonsis was one of Bettman’s “owners cabal” that railroaded the league into this situation. These 8-10 owners (none ever confirmed, just strong conjecture) had a stranglehold on everything, and it was galling that Leonsis was part of it. The “fans’ owner” himself, loveable Ted (as he portrays himself through his online blog and public appearances) was apparently a sham. It was all about the money. And to an extent, that’s understandable. The Capitals is, after all, a business. And most likely, a profitable one (as compared to other teams in the league). Kudos to Ted and the team for that. But that black ink on the ledger is built on and comes from the pockets of the everyday man. Us. The fans. It’s you and I who fork over excessive amounts of money for licensed goods, pricey ticket plans, overcharged food and beverage, and insane parking fees to enjoy a “Rock the Red” experience. Without us, the fans…well, the league wouldn’t be where it is today. Which is, by the way, maybe a distant fifth or sixth most popular professional sport in the U.S. Compared to the NFL, MBA, NBA, NASCAR, and MLS monoliths, the NHL is the runt of the professional sports litter. Discovering that Leonsis was taking cues from Boston’s Jeremy Jacobs was disheartening. I think what we as fans wanted was a heartfelt acknowledgement of what this stupid argument between millionaires and billionaires has done to us. It robbed us of four months of watching our beloved team compete. It stole from us the excitement of watching growing talent evolve, of fantastic goals and saves, of bonding experiences and coffee shop discussions, of late night excuses to stay up and watch a west coast swing. It cost us a lot in ways that we can’t explain. Monday morning I had two letters in my email, each from a team I follow and have purchased tickets from. And I heard of many other letters sent out to fans shortly after the lockout was declared (unofficially) over. We are extremely excited that the National Hockey League has reached a tentative collective bargaining agreement with the Players’ Association, pending final approval on both sides. This is certainly welcome news for all of us – fans, players, corporate partners, local businesses, broadcast rights holders, media, staff and owners – and especially our plan holders who have created such a fantastic Verizon Center atmosphere. Thanks to all of you for your patience, support and understanding during this process. We will continue to be in touch as more information becomes available, and all of us at the Capitals look forward to seeing you at Verizon Center in the coming weeks. I found out later that my reaction was not uncommon. What was truly staggering is that many of the teams with hardline owners or lockout sentiments put out similar statements. But there were a shining few ownership groups who “got it.” Does it make it better? Not really, since the lockout vote was unanimous. But apologizing to fans is a great start, and it’s nice to see a few teams actually building back the bridge that got torched over the last few months. So what am I trying to say after all of this? I’m not really sure, to be honest. I still love hockey. And I’m not going to boycott the NHL; I’d crack before the first period of the first game was over. I still plan on covering the Capitals for WeLoveDC; I’m hoping to do summaries of all of the Caps road games, as well as the usual playoff previews, draft coverage, trades, and so on. But one thing’s for sure: I won’t be buying tickets to a Caps game. Or purchasing Caps merchandise. Or spending a dime on anything related to the Caps. Not for the time being, anyway. I know it’s not much in the grand scheme, but for me it’s something. And I can live with that. 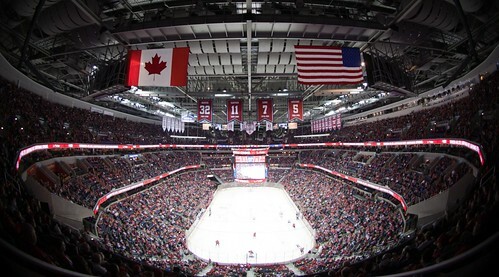 I’m not buying any Caps tickets or merchandise this season, possibly through 2013. I passed on a great deal of a Caps jersey for my 4 y/o before Christmas. If I get company tickets, I’ll go but not buy anything in the arena. Leonsis has 3 lockouts as owner of the Caps & Wiz, including two in the past two years. It’ll be a while before I’m willing to even go on stubhub and get $2 Wiz tickets. Ben, I think most fans from all teams feel pretty simliar. Yes, most of us die hard fans will return, sooner over later. It will take a while to spend money directly to the NHL, while I’m sure we’ll eagerly support our local bars watching the games of a sport we love. Some of the hockey blogs out there have people suggesting to boycott the first home game of each team. Empty arenas for the grand re-opening. Not a bad idea in my opinion.